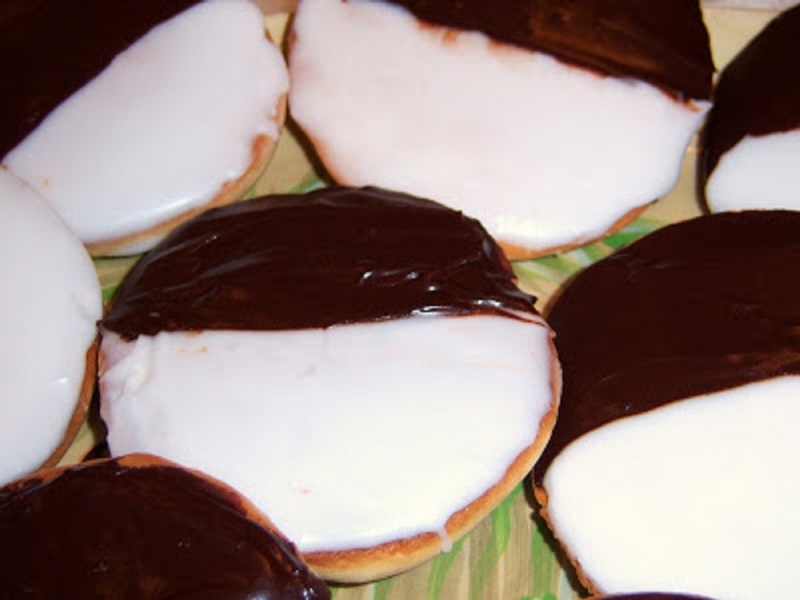 In Upstate New York Half moon cookies are very popular. I fooled everyone one day and brought some delicious homemade cupcakes over and frosted them with chocolate and vanilla frosting. Everyone thought they were half moon cookies instead of cookies! They all loved them. Moving to Florida I miss my hometown Utica, New York where these are popular cookies. In a pitch these bring back the hometown memories! In a large mixing bowl combine the flour, sugar, baking powder and salt, mixing well. ﻿﻿ Measure the 1-1/4 cups of milk in a 2 cup glass measuring ﻿ ﻿cup….then add enough oil to bring the liquid up to 1-1/3 cups. Add the eggs and continue beating an additional 2 minutes. Fill paper lined cupcake tins. Bake at 350° for 20 to 25 minutes or until a wooden pick inserted near center of cake comes out clean, or until cake springs back when touched lightly in the center. Cool. Frost half with white frosting and half chocolate frosting . add milk a tablespoon at a time until desired thickness enough to spread on cookie. Repeat above ingredients for chocolate, but add 1/4 cup dry cocoa powder and mix until smooth and spreadable. Original Recipe for Half Moon Cookie Utica Style! These are so happy - want both halves! Lovely! It reminds me of the Chinese Yin & Yang :) Have a good weekend, Claudia! Beautiful cupcakes, Claudia! I've made black and whites before...and it's hard to get them iced as perfectly as you have :) Brava! These look like so much fun and really delicious. Yummy! Have a great weekend Claudia. These look great! 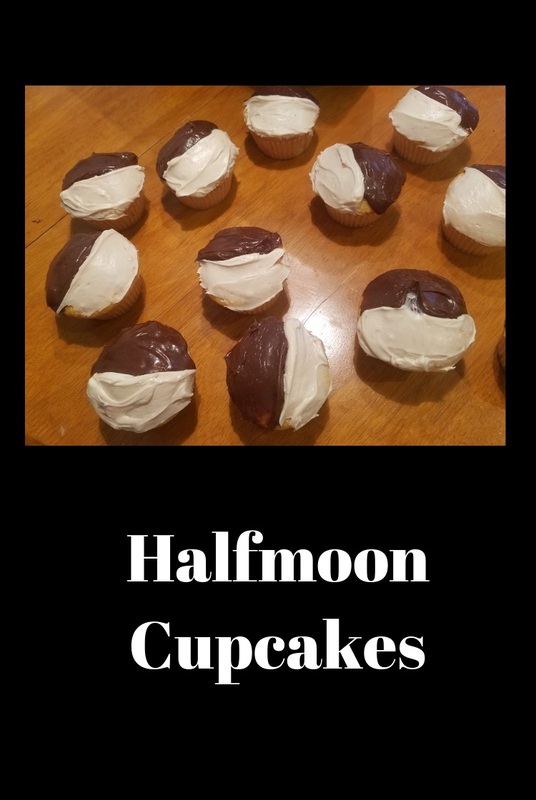 My daughter loves the halfmoon cookies and I'm sure she'll love these too. She always has to get one when we go to the Italian bakery near our house! Have a great weekend! Your cupcakes look great, bur I've bookmarked the recipe for black and white cookies. I've never found a recipe that is "bakery like." I guess I'd forgotten you're originally from Utica. I used to love the tomato pie that I got there; as a confirmed cheeseaholic, this was very unlike me, but the taste was fabulous. Looks amazing - I'll take both halves! Great idea from cookies to cupcakes! These look tasty and I'll bet they did not last very long. So what's next-perhaps black and white pie? Have a great weekend Claudia-buzz! Happy 4th of July Weekend! OMG YUMM-O, these look so darn good! Definitely requires talent to ice these so perfectly! Great job GF. Have a happy and safe 4th! I love that you turned one of my favorite cookies into a cupcake! I can't decide which I like better! 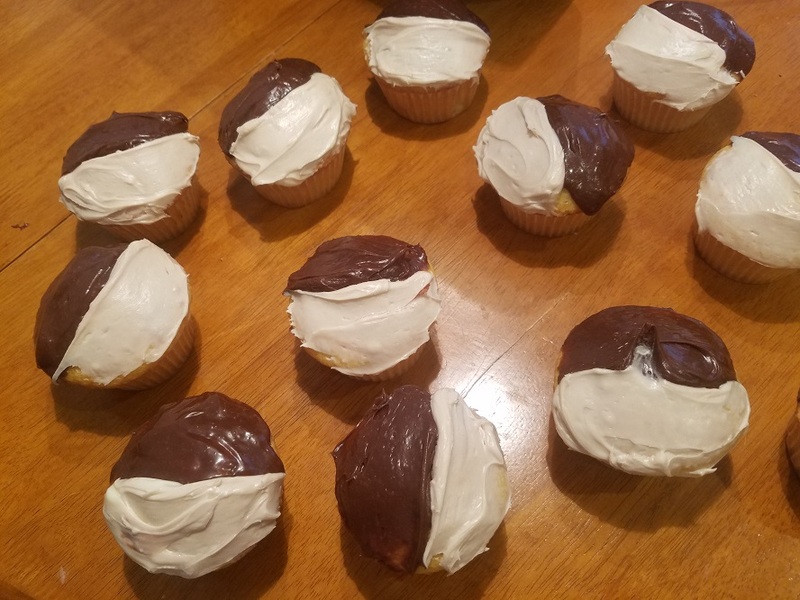 Love your black and white cupcakes, and especially the cookies, which I have printed out the recipe for. Every time we go to Publix, my granddaughter Gabby always wants to have her "black and whites"...now I can try to make this for her to surprise her. excellent sweet recipe and beautiful blog! Oh yum! These look so yummy! By the way, my daughter loves your virtual cat, LOL! What a great idea - these look and sound just delicious! Cupcakes are such a wonderful dessert all year round, but I especially like them in the summer as they take so little time to cook! 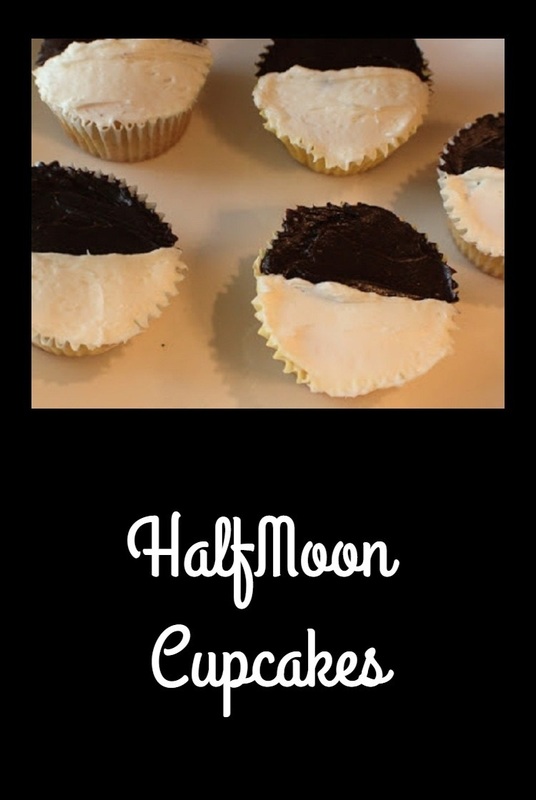 Thank you for sharing your half moon cupcakes with Let's Do Brunch.